An office procedure that can be done to fix many retinal detachment with low risk and high success and good visual outcomes. The retina is the light-sensitive layer of tissue that lines the inside of the eye and sends visual messages through the optic nerve to the brain. 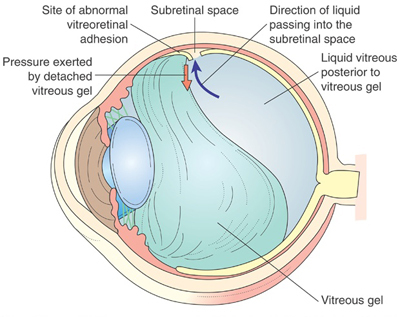 The vitreous inside the eye (see image) can pull on the retina and cause a tear. Once there is a tear, fluid can travel from inside the eye to under the retina. 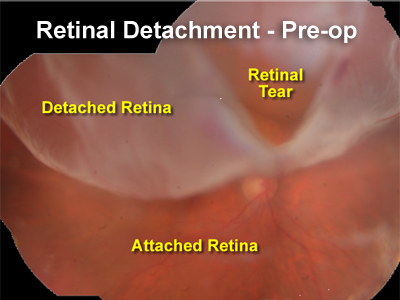 When the retina detaches, it is lifted or pulled from its normal position. This is usually accompanied by a shadow in the side vision. If the retinal detachment involves the center of the retina, central vision declines and sometimes becomes distorted. If not promptly treated, retinal detachment can cause permanent vision loss. What is a Pneumatic Retinopexy? There are several ways to fix a retinal detachment. Each technique involves reattaching the retina and then inducing a localized adhesion to keep the retina attached. The least invasive and least risky way to fix a retinal detachment is with a pneumatic retinopexy. A pneumatic retinopexy is an office procedure. 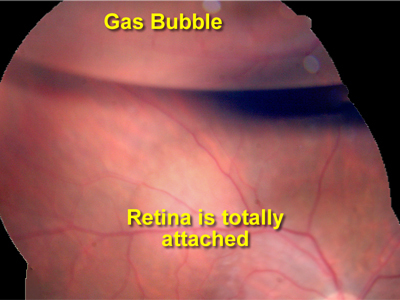 In an eye with a retinal detachment caused by a break that is superior (in the upper part of the retina) like the eye pictured on the right, a gas bubble can be injected into the eye to push the break closed and push the retina back into position. In addition to the gas bubble, a form of retinal adhesion is needed: either with cryotherapy--which is done on the same day as the gas bubble injection and works like glue, or laser--which is done once the retina is attached and works a like a staple. Since a gas bubble in the eye does not know where it is supposed to go, it is very very important that patients who are treated with pneumatic retinopexy position their head properly during the days and weeks following treatment. A bubble in the eye rises to the top of the eye. So patients with breaks at 12:00, for example, would need to sit upright looking straight ahead to keep the bubble on the break. Patients with breaks at 3:00 would need to lay on their side. Pneumatic retinopexy, in properly selected cases, has about a 90% success rate of reattaching the retina. It is almost impossible to reattach a retina with a break at 6:00 with a pneumatic retinopexy, because in order to place the bubble on the break, the patient needs to hang upside down. Believe it or not, this procedure has been done in very motivated patients with some success. A patient with a gas bubble in his eye cannot fly until the gas bubble re-absorbs. Most airplanes are pressurized to about 1/2 atmosphere, so a bubble in an airplane will double in size. In the case of gas filled eye, this causes an abrupt rise in intraocular pressure that can be blinding if the pressure in the eye is high enough to cut off the circulation to the eye.